For Number 7 in the series, it is a debut on A United View for Nick Brown (@LordBrown77) who explains why Chris Morgan is his favourite Blade. I've had plenty of Blades heroes in the past. From my boyhood heroes of Keith Edwards, Colin Morris, Brian Deane, Tony Agana to numerous others who lived the dream, who played for the club I loved then just as much as I love now. But the player I choose as My Favourite Blade is a player almost universally respected by most United fans, a man who has given his all to the club, and one of the few current players that owe the club nothing after years of strong and sterling service. I give you Chris Morgan. One of the things that I like about Chris Morgan is that he is similar to me. We are days apart in age - Morgan is a week older. We both grew up in small towns on the outskirts of Barnsley - I'm a Chapeltown lad, Morgan is a Penistone lad. We are both the same height, both play the same position (although I never progressed from a bit of park football in my teenage years), and if there is something I like in a player, something I hoped that I had in my locker when I was playing, it was the sort of attributes that Chris Morgan brings to the game. In many ways he has lived the life I wanted to lead growing up. Chris Morgan first came to my attention a few years back when Barnsley played in the Premiership, and I remember him getting sent off quite early in his career against Liverpool. Back in those days, before the internet was so widely available, I used to read the Green 'Un cover to cover and as a result I knew quite a bit about all the local clubs. The Green ‘Un was how Chris Morgan appeared on my radar. I remember his disciplinary record being poor (some things never change), and for a while he was regularly linked with higher profile clubs than Barnsley. He made his first steps in professional football as a Premiership player when Barnsley were riding the crest of a wave and over the subsequent years, as they fell away and dropped a couple of divisions, he was still there. In the Summer of 2003, Neil Warnock brought a few signings in, his usual free transfers. Some worked and some didn't, but this was the stand out signing of that summer, although it didn't seem that way at the time. On the face of it I was undecided whether he was a player who had slipped a bit and needed a new club to kick start his career again, or was a typical lower league journeyman who Warnock did seem to have a penchant for signing. When we got off to a decent start in the 2003/04 season Chris Morgan was at the heart of it; strong in the air,dependable on the ground, and not afraid to get stuck in. His major flaw was his disciplinary record which was still poor; this was shown when he was sent-off at Forest for striking at Gareth Taylor in retaliation for an elbow. He just seemed like one of those players who after a few games seemed to fit right in to Sheffield United and it was like he was part of the furniture straightaway. The best memories I have of Chris Morgan are during the promotion season of 2005/06 and in particular the game against Stoke on New Year's Eve, when our promotion bid was spluttering a little bit. With the scores locked at 1-1 going in to injury time, he rose the highest from a corner and planted the ball in the back of the net in front of a relieved Kop. Then came the following season where most people seemed to think that the top flight might just be a step too far, but he adapted his game, and showed the strong work ethic he possessed and his desire to do himself justice in the top flight. With Chris Morgan, what you see is what you get. An honest, whole hearted footballer, who never went on the pitch without being prepared to give it his all. You knew that when Chris Morgan was on the pitch he wouldn't hide and would always stand up and be counted. He was always a player with limitations; he was never the quickest, prone to regularly appearing in the referee's notebook and liable to get sent off for stupid, petty incidents. But then you had to accept these limitations, because he was one of those players who, at that period, made the Blades a team whose sum total was greater than the component parts. A huge shadow was cast over his career following the incident where he appeared to elbow Iain Hume and fractured his skull. He received a lot of negative press for this; there were calls for him to be banned for life, imprisoned for his actions, and for a few weeks he was one of the biggest hate figures in the game. 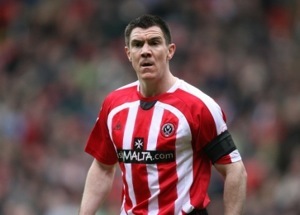 What I really admire about Chris Morgan is that the following week he didn't hide, he went out and played for the Blades, put in an excellent performance, and I think that incident changed the way Chris Morgan played the game a lot. He seemed a lot more mature, less prone to making silly rash mistakes and a lot more rounded. In the months that followed he played the best football of his career. It now appears that his career is coming to an end through injury, the career ending injury not coming solely from a bad tackle, or unfortunate break, but the fact that he tore the cruciate ligaments in his knee early in a game against Coventry City, at home, but he stayed on the pitch, battling and giving it his all, before going off at half time. By playing through the pain barrier for that extra 20 minutes, he did further damage and that damage could well be the difference between coming back as a player and retirement. With the appointment of Danny Wilson came the newest challenge of Chris Morgan's career, with his appointment as player-coach. I think this was the right move, because over the last 9 years Morgan has been a rock at this club and he is one of the few players that I feel Sheffield United owe something to, rather than the other way round. I think that, in the longer term, he will be one of those blokes who end up being a true club man with years and years of service to Sheffield United in various roles. I think that, as supporters, it is something that we all want to see. We can be proud of having a man of Chris Morgan's stature playing for the club, because men like that are very few and far between in the world of football nowadays. Chris Morgan may sup pints of molten steel & chew on lumps of red hot coal but he can still play a bit - I'll never forget the overhead kick he scored at the City Ground against Forest in our 3-0 FA Cup win. Great player.